We want to be online. We need to be connected. 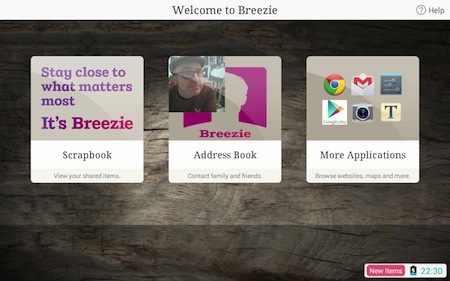 The Breezie deserves an upbeat title, with awards given to its creators and the potential for a digital device that can really address issues for older users – having a simple interface, and a ‘sponsor’ look after the details, which tend to catch people out. A sponsor could be a carer, relative or good friend with the skills to get to the Breezy Hub and set up Skype, Gmail and Facebook accounts, then to add people to the simple own address book. It would be difficult to not be jealous of Breezie owners, as they are getting support over the internet in a truly personal fashion. There is no CD in the box, put there for scale.. 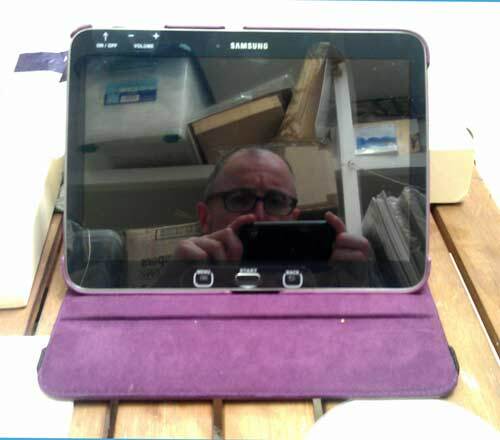 When buying a tablet online or anywhere else for that matter, it is just a case of making the decision to buy ‘That One’ and then hand over a credit card or cash. 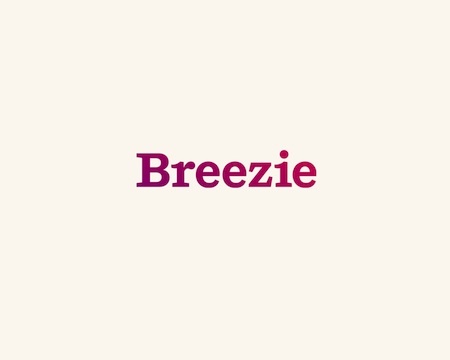 Buying a Breezie means you can set it up at the point of sale – the sales person will ask for details to set up the Google, Facebook and Skype accounts. If you already have any of those services set up, make sure you have the details nearby. This is certainly a refreshing change in the purchasing process, as you may not live with your parents/grandparents, but you can get the Breezie set up and sent to them already to go! Cannot fault this at all. 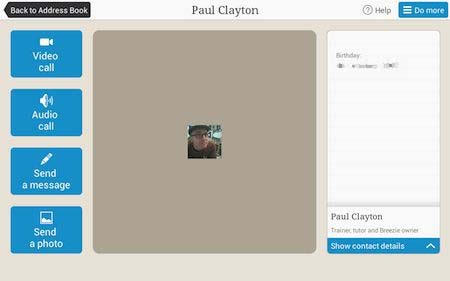 However, if you like to have a go at setting up yourself, this option is available. Make sure you make time to do this in one sitting, as I found out after the repeated efforts which were halted mid flow with phone calls and appointments. After successfully breaking the set up process, I needed Skype reinstalled, with a very nice support lady giggling down the phone at me to help with this. She knew I had asked to do the set up myself, so I guess I got the deserved humiliation. It must be said, even though I did a very typical approach that many men do and operated the Breezie before I read the manual, the manual is well designed and clear. I can imagine it being of use to many completely new users. quite a reflective screen…use the stylus, as it gets greasy quickly. The actual buttons on the tablet being labelled is a great start when you open the box – even the power cord has a label to indicate the right way up. A definite bonus point. The system itself is really friendly and straightforward. Options for a large or medium size font, with good sized buttons on a plain background all make it friendly on the eye. User guide and a manual…a real difference! What sets the Breezie apart from other tablets besides the basic screen buttons is the well illustrated (and instructive) user guide to ease the completely digitally unaware to using the tablet. The other difference, and this is a huge difference, is the Breezie user has a sponsor to assist with using the machine. 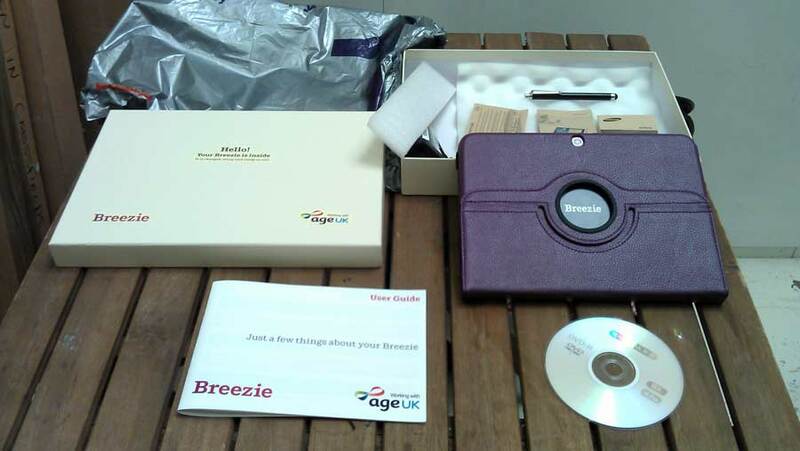 The sponsor is a friend, carer, or relative who has the internet know-how to set up the accounts, and can access the Breezie hub – the place where the Breezie can be managed, contacts can be set up for email, Skype etc. I have had some problems with changing the contacts so far, but I’m told by the very helpful support that this may be a connection issue. Hey, it’s early days so far. Having a look around the help section of the Breezy Hub found a manual for sponsors too, which was useful as the site seems to be in its early stages. The good Breezie team have taken the time to put together their own selection of apps which have been checked for suitability. 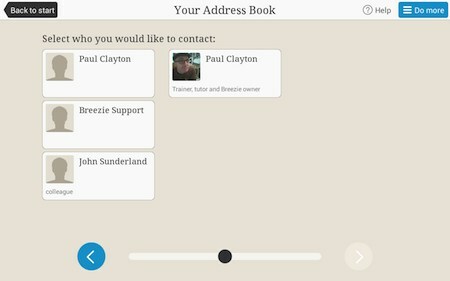 If you do want to install a new ‘app’ then you choose from the store and the Breezie support team confirm the install. This is very confidence building. As the screenshots show, the system is very straight forward to work, with direct access to the address book with buttons just saying what they do. Simple, straightforward and not hard to navigate. If you would like a demo of this great device, please get in touch. So, coworking. What is it about? Plenty going on. Here’s to new adventures.